The evaluation of bone health has become an essential component of your wellness. Osteoporosis is a disease that thins and weakens bones to the point where they break easily, making even the simplest of tasks, such as bending, stretching and twisting motions to be a painful experience. To detect osteoporosis accurately, Radiologists use an enhanced form of X-ray technology called dual energy absorptiometry (DEXA). Bone Densitometry (DEXA) studies are today's standard for measuring bone mineral density (BMD). The entire DEXA study takes only minutes to complete and is a painless procedure. 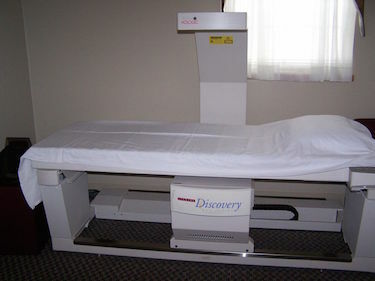 At Tolland Imaging, we are proud to introduce our Hologic Discovery Densitometry unit to our patients and physicians. The Hologic Discovery system allows us to perform the most comprehensive evaluation of bone mineral density (BMD) measurement and Instant Vertebral fracture assessment. The two leading factors associated with osteoporotic fracture risk. The evaluation of bone health has become an essential component of your wellness.